Lurking among the cobble and bedrock of Eastern North America’s oldest mountain streams, endures a rare and ancient giant that has inhabited these environments for over a hundred and sixty million years. Growing over two feet long and covered with wrinkly folds of skin that oscillate within the current, the hellbender salamander is one of the most bizarre animals found on this planet, however it is these unusual characteristics that make this living fossil one of the most beautiful and important river creatures you will ever see. Once occupying the headwaters of nearly all Eastern North America’s largest rivers, hellbenders are now at great risk of disappearing due to the degradation of stream health and water quality. Often termed an aquatic “canary in a coal mine” these fully aquatic salamanders use their skin to absorb oxygen through the water, and because of this they are extremely sensitive to pollutants in the water. With their habitat occurring in the headwaters of some of the largest rivers in the US, the presence or absence of hellbenders is a great indication of not only the overall health of a freshwater ecosystem, but also gives insight into the quality of water that we use in our everyday lives. A Hellbender (Cryptobranchus alleganiensis) attempts to eat a Northern water snake. The human like hand of a hellbender. Painted in the patterns of their stream bed homes, two male hellbenders size each other up as they attempt to court an egg-filled female. For millions of years these ancient animals have inhabited the cobble and bedrock of Eastern North America’s oldest mountain streams, and their wellbeing is very much tied to the health of their benthic homes. Unfortunately, hellbenders are now at great risk of disappearing due to the degradation of stream health and water quality. Increased sedimentation, resulting from silt, dirt and other pollutants running into streams, has smothered streambed environments, filling in all the holes and spaces hellbenders depend on throughout their life. 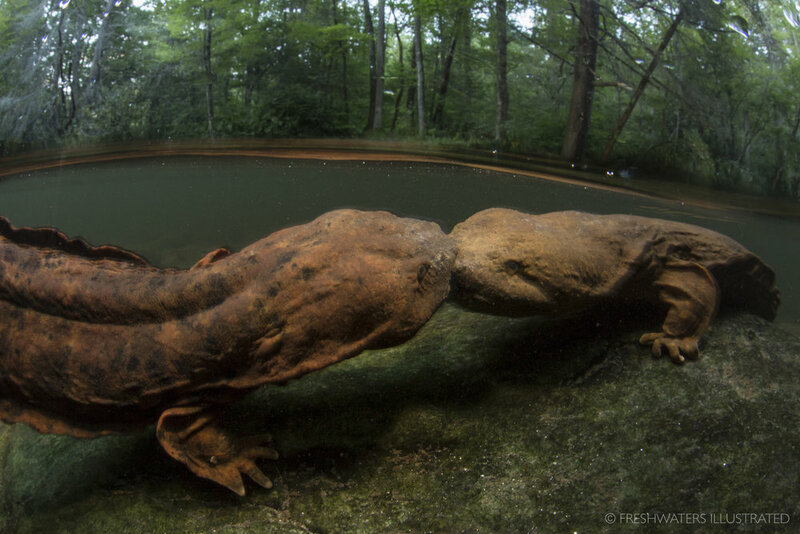 This often unseen form of pollution, suffocates streambeds destroying the homes and habitat of these giant salamanders. Unfortunately, hellbenders are now at great risk of disappearing due to the degradation of stream health and water quality. Increased sedimentation, resulting from silt, dirt and other pollutants running into streams smothers streambed environments. Degradation from the impacts of improperly managed livestock and agriculture are one of the may sources that result in sedimentation. This often unseen form of pollution, suffocates streambeds destroying the homes and habitat of these giant salamanders. Two male Eastern hellbenders (Cryptobranchus alleganiensis) fight over prime breeding habitat. Unfortunately, hellbenders are now at great risk of disappearing due to the degradation of stream health and water quality. Quality habitat is often severely degraded once streams leave protected lands and enter towns and cities. Without a proper riparian buffer large amounts of sediment and other pollutants run into streams after heavy rains, smothering streambed environments. This often unseen form of pollution, suffocates streambeds destroying the homes and habitat of these giant salamanders. Concealed within the complexities of its stream bed home, a hellbender salamander takes refuge below a bedrock slab. For millions of years these ancient animals thrived, living amongst the cobble and bedrock of Eastern North America’s oldest mountain streams. Their wellbeing, very much tied to the health of their benthic homes. Unfortunately, hellbenders are now at great risk of disappearing due to the degradation of stream health and water quality. Pollution and trash along the banks of a hellbender stream. 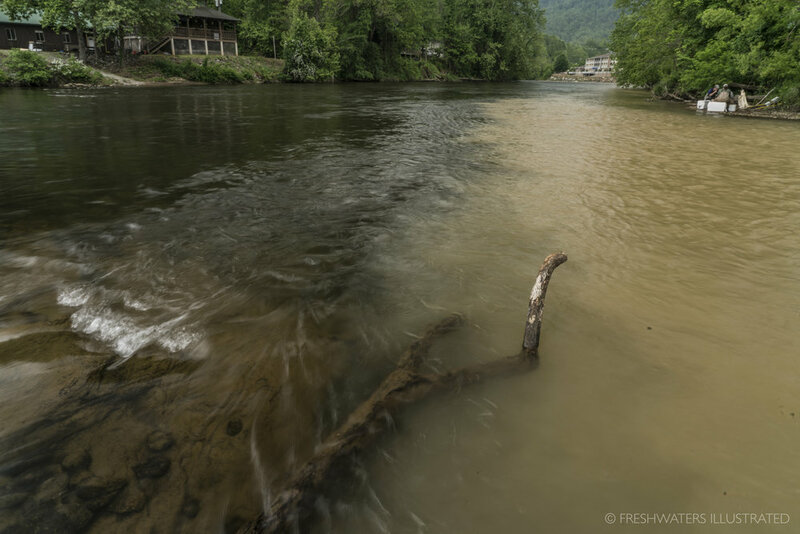 Hidden beneath the surface of Southern Appalachia’s rivers and streams lives some of the greatest examples of freshwater diversity found on this planet. Tragically, the surface also hides how poorly we have treated these environments. 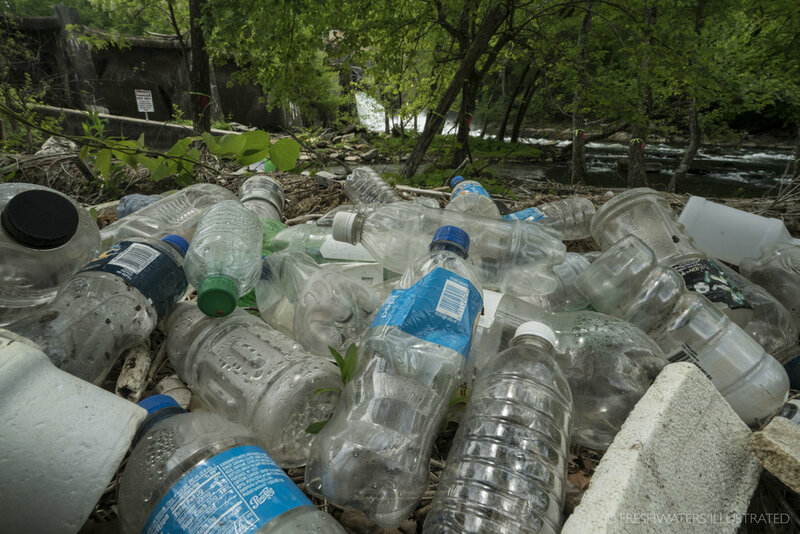 Trash is often a large problem, even in some of the most protected watersheds, and can severely impact species like hellbenders that need extremely clean water to purist. Fortunately there are many passionate individuals out there working to reverse this. Under the light of a full moon, an Eastern Hellbender lurks among the cobble and bedrock of a Southern Appalachian river. Unfortunately most people are unaware of the detrimental impacts that can come from moving rocks in a river to build dams or rock sculptures. The death of this female hellbender was the result of people moving large flat rocks to build a rock sculpture. This destructive practice not only kills animals but also destroys vital spawning habitat and refugia for these declining salamanders. Biologists with the North Carolina Wildlife Resources Commission install Hellbender breeding boxes in a stream where the habitat has been degraded. These boxes provide hellbenders a place to lay eggs in rivers that may have to much sediment. Biologists Jeff Humphries and Mike Sisson record and measure information on an Eastern Hellbender (Cryptobranchus alleganiensis) in a Southern Appalachian stream. Jeff Briggler, Herpetologist with the Missouri Department of Conservation takes measurements on the health of three Federally Endangered Ozark hellbenders (Cryptobranchus alleganiesis bishopi). Due to poor water qualtiy, disease, and a number of other anthropogenic factors the Ozark hellbender has experienced large population declines. Jeff Briggler, Herpetologist with the Missouri Department of Conservation releases an Ozark hellbender (Cryptobranchus alleganiesis bishopi) after measuring and testing it for disease. This large individual was missing one of its front hands. Due to poor water qualtiy, and disease missing hands and limbs have become a more frequent occurence for this Federally Endangered species. In 2011 the Saint Louis Zoo successfully bred Ozark hellbenders in captivity. This world first for either of the two subspecies resulted in 63 baby hellbenders, and was a huge step in the potential restoration of this species. Eastern Hellbender (Cryptobranchus alleganiensis) in its habitat.